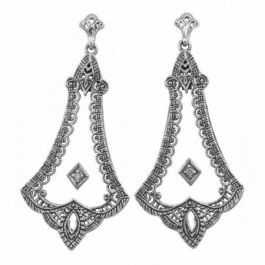 The authentic Edwardian and Art Deco filigree jewelry is in very high demand currently. If you find a fine example you will pay a premium regardless of its condition, especially the vintage gold filigree items that are just outrageous in price. Even the sterling filigree jewelry sells for over $100, $200 or more for a small Edwardian pendant. 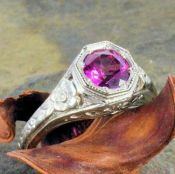 Sadly most authentic Edwardian and Art Deco jewelry is priced out of reach for the average collector, wearer or bride looking for affordable vintage bridal jewelry. 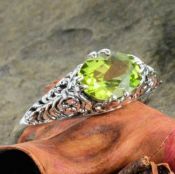 This line of filigree reproduction jewelry I am offering is exquisite in design, detail and craftsmanship. Among this selection are some very hard to find items such as Art Deco frosted Quartz crystal jewelry, cameo flip rings, flip pendants & Marcasite jewelry. Most of the Victorian, Edwardian & Art Deco designed jewelry is an authentic representation of it's period. All of the items are manufactured in sterling silver as a limited production item with an estimated 5 to 7 day shipping time (subject to availability all items shown are not in stock but may be back ordered), please allow extra days for delivery. 14k white or yellow gold is also available as a special order in certain selections, allow up to 6 to 8 weeks delivery. All gemstones are genuine unless otherwise noted. E-mail if you have any specific questions about size and lengths. 469 Items. Showing Items 1 thru 15. An embossed Art Deco reproduction ring with three white topaz in round, trillion and square shapes with a total weight of 1.00 carats. 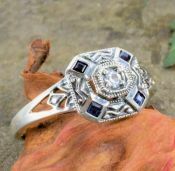 This is a fabulous embossed Art Deco reproduction ring with genuine gemstones, three white topazes along the front and sapphire accents along the shoulder. 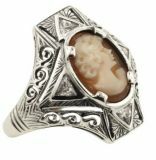 Featuring an oval shaped shell cameo of a lady in profile with four trillion cut cubic zirconia. Genuine sapphires with three white topaz accents. Featuring a 1.00 carat sized cubic zirconia with genuine trillion cut sapphire accents in a filigree and high polished detailed setting. 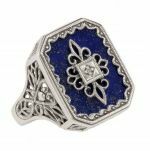 An Art Deco style filigree ring with a lapis lazuli tablet that has a diamond accented center plaque. The filigree work has a flower on the sides of the gallery. 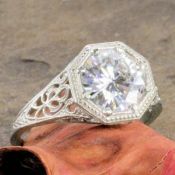 An Art Deco style filigree ring with a frosted sunray crystal tablet that has a diamond accented center plaque. The filigree work has a flower on the sides of the gallery. 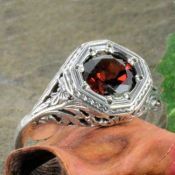 An Art Deco style filigree ring with a black onyx tablet that has a diamond accented center plaque. The filigree work has a flower on the sides of the gallery. Featuring a single 4.0mm emerald set in a beaded bezel setting. 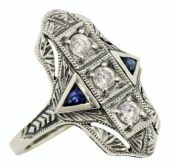 An Art Deco style filigree ring with a lapis lazuli tablet that has a diamond accented center plaque. The filigree work has a heart shape along the shoulders. 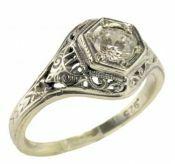 An Art Deco style filigree ring with a frosted sunray crystal tablet that has a diamond accented center plaque. The filigree work has a heart shape along the shoulders. 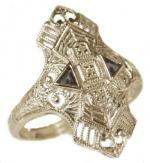 An Art Deco style filigree ring with a black onyx tablet that has a diamond accented center plaque. The filigree work has a heart shape along the shoulders. Featuring a lapis lazuli tablet with marquise shaped sapphire accents.